GO Transit has started processing the claims and passengers are now being issued credits. Make your claim here. I just submitted mine this morning. Looks like GO set it up to just automatically approve anyone from that day. Note the very last email from GO's claims email account sent to Crazy Train reader Al. Mine has not yet been approved and it was submitted last week. I was on the same train as you. I submitted mine last week and it's still in progress. 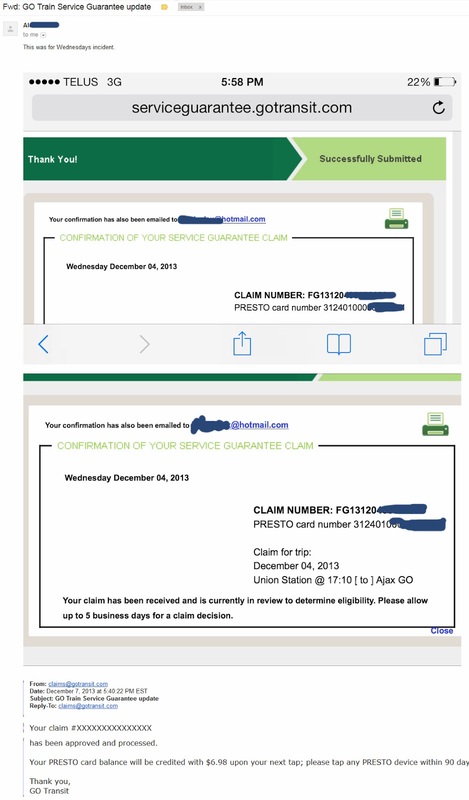 Update: I submitted my claim on Dec. 5 and just now (Dec. 9, 9:35pm), received the email my claim was received. As per the time in the photo, I submitted mine an hour before the train arrived in Ajax, but it was 15 minutes after our sheduled arrival time at ajax, we ended up in Ajax at 6:55. I was probably first in line for a credit. that's why I got it on Saturday.